Your mom was right when she told the child-you to eat your vegetables: they’re good for you. End of story. I’m not your mom, or even your boss, but I’m going to tell the article-writing-you to publish open access, because it’s not only good for you, it’s also the right thing to do. 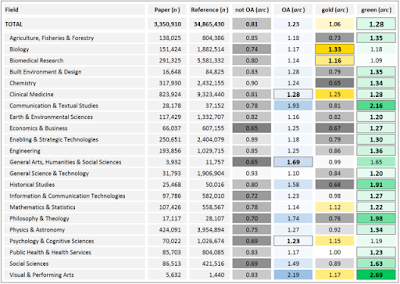 It’s good for you because articles published open access are cited more often than articles that are not. Let me repeat that, because you look like I just offered you a free trip to the Bahamas: articles published open access have more impact (as defined by being cited by other articles) than those that are not open access. This makes perfectly logical sense: an open access article, by definition, is available for anyone to download and read. No cost, no barriers. Compare this to a more traditionally-published article where online access is behind a “paywall”—you have to pay the publisher to download the article, unless you’re privileged enough to belong to an institution whose library has pre-paid the publisher for access to their articles. In this most-common scenario, many, if not most people leave the paywall without the article. To put it more simply: open access = more readers = potentially more citations—and that’s good for you. 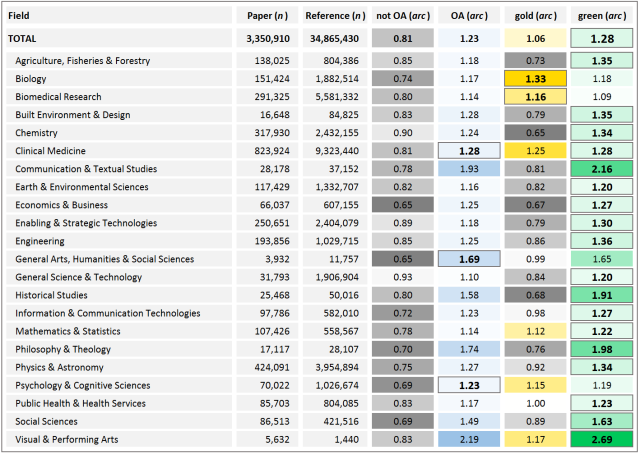 You can see from the table that for every field, open access papers have greater impact than non-open access papers. Why is it the “right thing to do”? If you care about social justice, you should publish open access. Could your research be of benefit to underprivileged communities, other researchers without access to high-cost journals, health workers providing urgent patient care? Is there a research field where open access would not benefit less-privileged researchers around the world? Then don’t lock your work behind a paywall! Publishing open access is a concrete means to “fashion a more humane and just world”—part of the vision and mission of the University of San Francisco—and it ought be the default position of the University. How do I publish open access? There are many ways, but let’s keep it simple: just do what you normally do—publish in any journal you want. But then give a copy of your paper to your Library’s institutional repository (IR). They’ll make it available open access. (USF folks: Contact Charlotte Roh, Scholarly Communications Librarian, for more details: croh2@usfca.edu). Administrators, granting organizations, hiring and promotion committees are all-too-often caught up in trying to quantify research “impact.” Their guiding star is the Impact Factor: the Kim Kardashian of journal metrics—famous for being famous, and valuable primarily as a brand to be sold. This is a map of about a day’s worth of downloads from Gleeson Library’s open access Scholarship Repository. 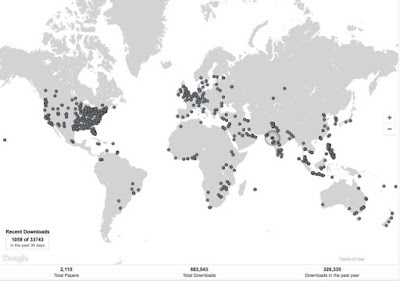 As you can see, downloads are happening all over the world. The first has been downloaded more than 13,000 times; the second more than 23,000 times! If you don’t recognize these high-powered faculty authors, it’s because they’re not faculty— they’re students. Now look again at the subjects of these works, and look at the map. Reading Comprehension. Students with Disabilities. Newborn Umbilical Cord Care: downloaded worldwide. This is social justice in action, viewable in near-real time on a Google map; this is not an impact “factor,” but true impact. By simply publishing open access, these USF students have had more real impact in the world than any number of high-calibre faculty publishing in (paywalled) high-Impact Factor journals. Administrators, granting organizations, hiring and promoting committees, take note.